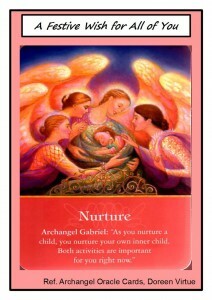 Heal Your Puzzle » Blog Archive » Do you Believe in Angels? We have an abundance of stories and references to Angels in our Traditions and they are mentioned in many religious faiths and mythologies. With Christmas just around the corner, I would like share with you some of my understanding and my experience of Angelic Energies. An Angel is described as a supernatural Being or Spirit, often depicted as benevolent celestial Beings with magnificent bird-like wings, halo, robes and glowing light. They are considered to be Divine Messengers or Guardians who guide and protect us with the Archangels having the most significant roles; some of the best known are Gabriel, Michael, Raphael and Uriel amongst many more. For most of my life, Angels were just part of our folklore and something magical in children’s stories and at Christmas. My life was my life and was my responsibility! It was not until I studied and started working with Energy Healing that I began to ask more questions, initially to clarify this feeling of there being more than just me present in a room (unsettling for a while) and then to consciously work with this apparent ‘Team of Helpers’, all of us focused on achieving the highest possible outcome! My experience has never been of a particular named Angel talking to me like a person; it is more like a sensory awareness of a vast presence and not just one presence but an amalgamation of many speaking as One or sharing ideas until a common way forward is found, always supportive, always helping growth and understanding. This I grew to realise is my inner understanding about Love although it has not always been my Life’s outward experience – no judgement, no punishments, no degradation, just a wonderful nurturing feeling always there. And this is what Christmas is for me – a time to celebrate and experience this Love and bring it more fully into my Reality and those around me… Wishing this for all of you over this Festive Season!